1. Instead of an outside shot, this shot of Music Library written on a cart sets the scene in a more playful way than a conventional outside shot, which is good because I did not take any interesting outside shots. The smiley face makes me think that people might have more fun here than in another library. 2. 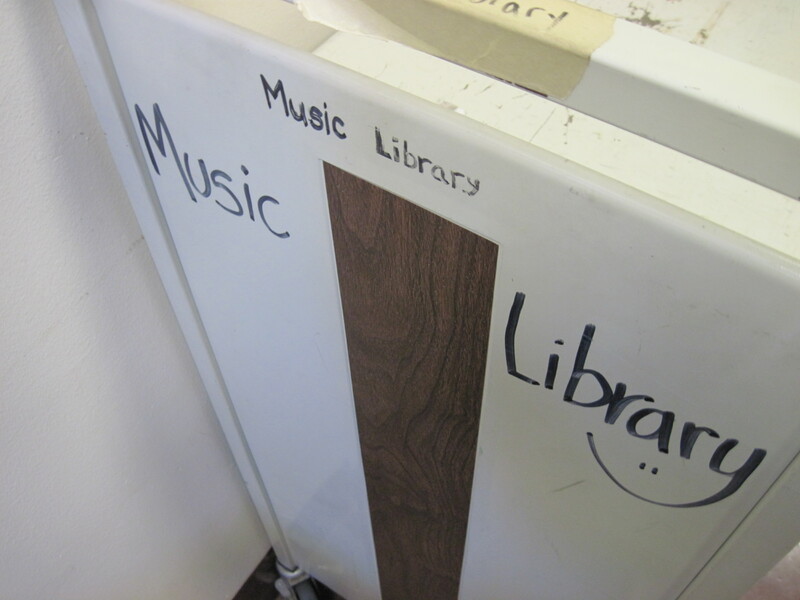 Stephanie Bonjack, the music librarian, is young, hip and more artsy than I would expect. 3. 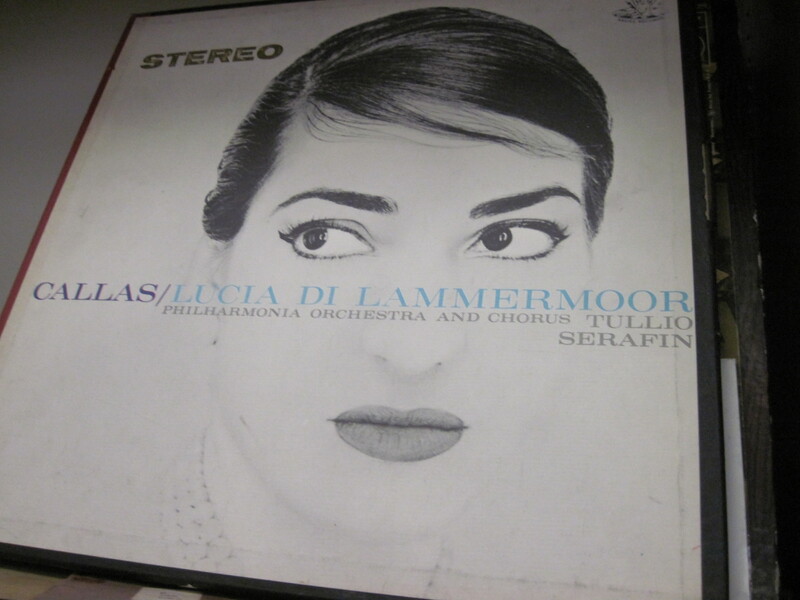 A record with Callas’ face in Stephanie’s office caught my attention. Stephanie Bonjack defies the somewhat outdated stereotype of a librarian. She looks as if she might be the art director of a magazine or work at an art gallery. And if I thought most librarians were recluses, her favorite part of the job is interacting with students. I might like to follow the idea that Stephanie defies the old-timey stereotype of a librarian. Poking around her office, I found an Obama sticker, Shepard Fairey art and a record with Maria Callas’ face. Stephanie said some interesting things I could follow up on; that the library is starting to offer more popular music books. She said this is good and she thinks there should be more expansion in these areas because only including classical materials gives the library a sense of “false elitism.” I took some shots of hip-hop and jazz books, etc. 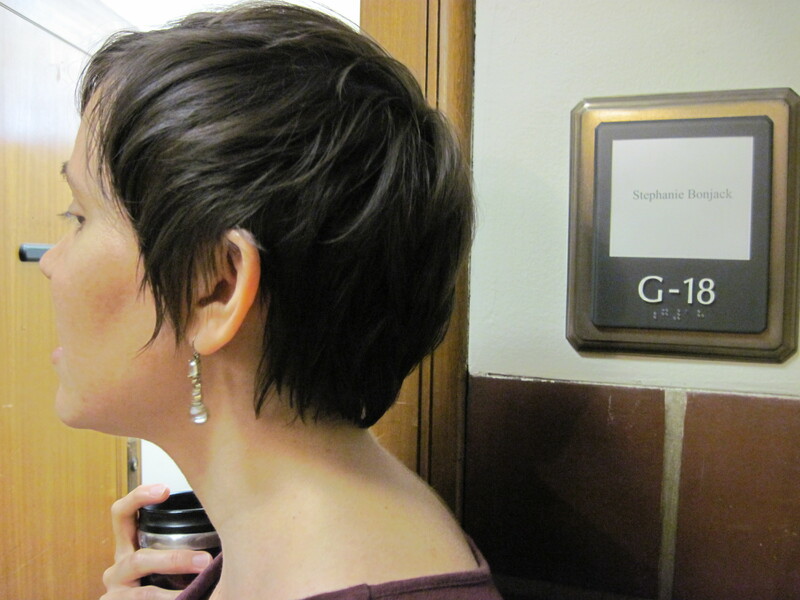 I also saw two other librarians – both were fashionable like Stephanie. Stephanie remarked that her department boasts fashionable people. It might be fun to have the male and female librarians in the music department talk about their fashion choices. I could interview 2-4 of them about fashion and take pictures of them in the library environment. I would have to take more photos tomorrow and conduct not one but a few interviews, but this could be fun!